Yes, I see your gaze fall to my waist as I walk past you. I see the confusion in your eyes as you try to slyly glance at the small tube threading its way from under my shirt to my heavy backpack. The way you stop what you were doing briefly then remember to try and act inconspicuous while clumsily attempting to pick your book back up, type at your computer or play on your phone. Like a statue, you had forgotten to move. You’re frozen in place, completely perplexed by the sight in front of you. I often wonder what you think my feeding tube might be and what this view looks like to someone who has never been introduced to medical devices. To be honest with you, I had never met anyone with a feeding tube before I was thrust into the world of illness so I truly have no idea what your perspective might be. Though from what I can gather by your astonished gaze, you are very intrigued by this small purple apparatus. 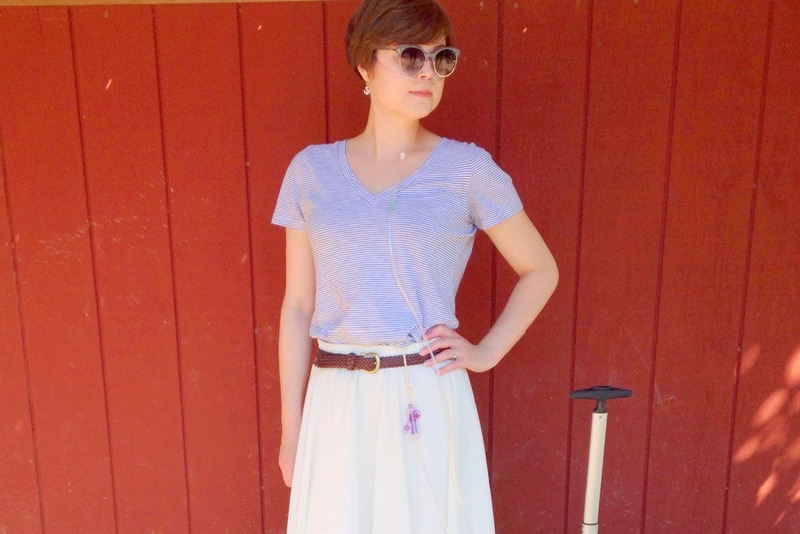 When I first received my feeding tube, your stares truly bothered me. They made me feel alienated. I felt uncomfortable in my own skin every time I left the house because I knew your eyes would be waiting for me. It was as if I had suddenly lost all the confidence and self-acceptance I had worked so hard to build over my 22 years of life. Your obvious gape made my insides churn with a mixture of embarrassment and, truthfully, irritation. Didn’t your parents ever teach you not to stare at strangers? I know you didn’t mean to invoke these feelings in me; you simply were curious and not considering the emotional impact your gaze may have on me. Staring is part of human nature, a primal drive that takes over when we are alarmed or bewildered, and I understand that; I truly do. You had no idea what I was going through at the time, no idea how difficult my life had suddenly become after the failure of my digestive system. At 22 years old, I was told I would never again eat my favorite meal. It was a tempestuous time in my life. Feelings of alienation were already stirring inside me before your curt glimpse. How would I go out with friends? How would I handle holidays? But how could you have known I was already an emotional mess. The fact is, you knew nothing about my life, my circumstances, my struggles or the repercussion your nonchalant glance would ensue. At times, I honestly contemplated walking right up to you and asserting myself. I wanted to march over and demand your gaze be directed elsewhere. I’d insist you were being rude and that you had forgotten your common courtesy. I want you to know, person staring at my feeding tube, that I no longer feel that way. What I have realized over the past year is that it’s not your fault for staring. Yes, a few of your “glances” may have been a bit ridiculous and extended in length, but you weren’t trying to hurt me. I am in no way exempting you from your need to better your manners when it comes to staring, but I want you to know I am not insulted by them any longer. Let’s be honest with ourselves, we all stare. I find myself staring at people all the time — and I am not the only one. An odd hair color, an eccentric outfit or an interesting makeup choice may induce my wandering eyes for a moment too long. Embarrassed, I realize I, too, made the mistake of letting my gaze linger on those that implore my curiosity. So how can I debase your stares when I myself am guilty of this crime? Truthfully, a random tube jetting out from under your shirt would prompt me to stare at you I am sure! I decided I wanted to write you this letter to express how I believe we can both change our actions to benefit everyone involved. I promise I will do my best to help you understand just what my tube is for, and you can make the effort to simply inquire. Instead of ogling next time you see me out at the local grocer, you can politely ask what my device is used for. If you are too shy to speak to me, I understand, but then please remember, if you are really that shy, you probably shouldn’t be staring so obviously. If you are going to make the decision to stare, try to make it modest and maybe shoot me a smile afterwards, acknowledging that, yes, you did in fact gaze my way and know that I saw you. This will cut down the awkward intrusion I feel when you distinctly gawk, then pretend you didn’t. That is honestly what frustrates me the most. I would much rather have the mutual recognition. So since I have you here, let me explain what the interesting device connected to me is. That small piece of plastic is a life-sustaining medical device called a feeding tube. This device is given to individuals young and old who are unable to get enough nutrition by mouth. The reasoning behind the placement can be anything from oral aversion to failing organs. In my case, almost my entire digestive track is paralyzed due to a degenerative autoimmune disease known as systemic scleroderma. This disease hardens the soft muscle tissue in my digestive track, resulting in a lack of peristalsis (the small waves that move food along) and an inability to absorb nutrients. My feeding tube is located in my abdomen and bypasses these malfunctioning organs. It provides my body nutrition in an easy to absorb, pre-digested formulation, constantly supplying me with formula that I carry in a backpack along with the special pump that regulates how much enters my system by the hour. You may hear a small “whirring” if you are close enough to me. This is the sound of my pump busily buzzing to keep me fed. I personally am more than happy to talk with you about the device that keeps me alive or about the condition that caused me to be reliant on the tube. This is actually a great opportunity for me to spread awareness about my disease and to educate other individuals like yourself about respectful ways to interact with patients like me. With my hectic medical schedule, I have little time to speak to anyone besides doctors, nurses or front desk staff, so our conversation could actually be the highlight of my day.